Painting and testing piña coladas at Tsk Tsk. Photo via Facebook. While we wait for ~HORSEFEATHER~ to open in the former Ziryab this fall, owners Justin Lew (creative director and director of operations for Future Bars Co.) and Ian Scalzo (beverage director of Future Bars Co.) have decided to open a temporary pop-up in its place called Tsk/Tsk (not unlike Mr. Lew’s Win Win Bar and Grand Sazerac Emporium, the temporary Tenderloin bar between the transition from Club 441 to Tradition). Hoodline originally spoke with the duo, who want to offer up a casual/lowbrow interim spot to hang out until they get approval and permits from the city on upcoming changes to the space. And now some additional details have been released: Tsk/Tsk will open on Monday June 29th (UPDATE: OPENING DATE IS CURRENTLY TBD! 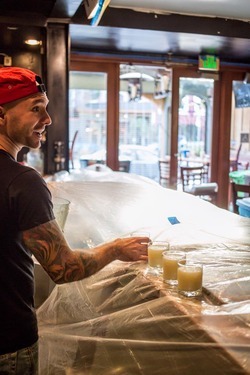 ), and the menu will feature some fun adult beverage options, from the Electric Margarita to a banana orgeat piña colada or sweet tea mint julep from the slushie machine (we can pretend it’s hot out, we’re good at that). There will also be boilermakers, beers, and more. Rounding out the offerings will be some bar vittles that look like The Dude invented them in a dream, including a burger (or cheeseburger) on King’s Hawaiian bread with grilled pineapple, pickled jalapeño, and teriyaki sauce; waffle fries with smoked nacho dust (ground-up nacho-flavored Doritos with chipotle powder); and wings (buffalo, Korean/Gangnam, and Chinese salt-and-pepper style). Hours will be nightly 6pm-2am; some earlier, end-of-week happy hours may kick in soon. 528 Divisadero St. at Fell. After Mission dive bar The Attic closed last year, it was taken over by new owner Caroline Brown. Uptown Almanac now reports that it has reopened as the blandly named ~24TH STREET BAR~. The new space is complete with Mason jars, exposed Edison bulbs, reclaimed wood, and uncomfortable metal stools. Sigh. At least the drink prices sound really approachable. 3336 24th St. at Osage, 415-282-2440. Mezcal ready for tasting at Bartlett Hall. Photo from Facebook. 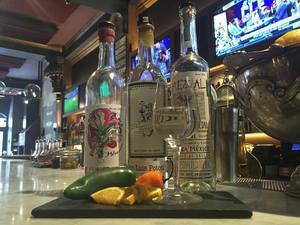 Union Square’s ~BARTLETT HALL~ is getting ready for a spiritous good time with their Mezcal y Tradición tasting on Sunday June 28th. From 2pm until 6pm there will be 20 different mezcals to taste and learn about, from Wahaka’s well-known, award-winning selections to smaller producers like Mezcal Vago. There will also be plenty of bites to keep you going, from places like Colibri, Mosto, and Uno Dos Tacos. 242 O’Farrell St. at Cyril Magnin, 415-433-4332. Anyone who knows Dr. Champagne, aka Jerry Horn, will be happy to hear he now has a place to call his own: Tiburon Wine. His new wine store and tasting room has room for 22 inside and 8 outside on their patio. Come by for a glass, a bottle, and bring some home too. You’ll find one of the best selections of French Champagne in Marin County, plus local wines too (and it’s not all fancy—you’ll find a bunch of easy-on-the-wallet wines to enjoy, from $10-$30). There will be special guests as well: look for an upcoming four-course pop-up in August, with Gordon Drysdale. Open daily 12pm-8pm. 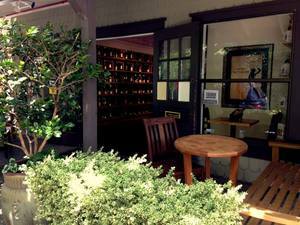 84 Main St., Tiburon, 415-435-FIZZ.